Players from all over North and South Carolina and as far away as Georgia came to attend. Participants in both doubles and mixed doubles were treated to cool morning temperatures but sunny skies and lots of competitive play. SCCL residents and local sponsors provided snacks, drinks, and lunch to players during tournament hours. Resident hosts served as court officials, provided golf cart transportation, and even housing to visiting players. A Friday night banquet featured wine and pasta along with live music, dancing, sing-alongs, and even an appearance by Sun City Hilton Head’s famous dancing pickle! 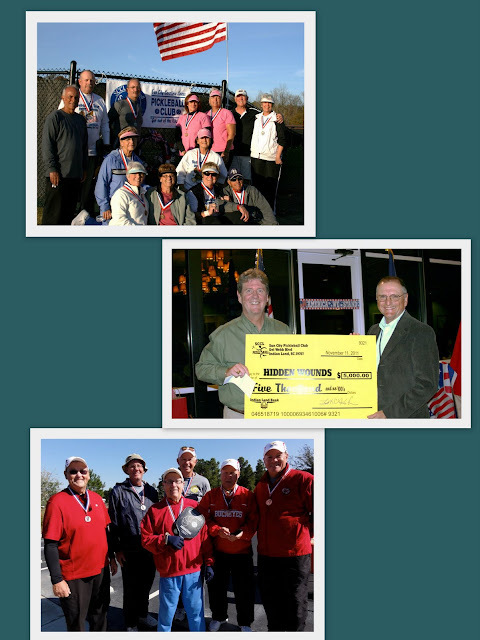 Tournament director and USAPA ambassador, Frank Kinder presented a $5,000 dollar check, along with a plaque and tee shirt commemorating the event to Hidden Wounds co-founder and director, Chris Younts, during the banquet on behalf of the SCCL club. Frank passed along his gratitude for all of the wonderful sponsors and the many volunteers who made the tournament such a spectacular event. Our hosts in CL really set the bar high for anyone who dares to plan an invitational tournament that includes them! B n' B accommodations, unending free food, water, shirts & giveaways, a dinner/dance, Veterans Day ceremony, sing-alongs, awards...all for a good cause-our troups, benefiting, "Hidden Wounds"...amazing! The chance to rub elbows with other PB communities (73 teams total including folks from SC Hilton Head, SC CL, Myrtle Beach, Atlanta) was also very informative & fun. On behalf of the Sun City Traveling Team, THANK YOU, Carolina Lakes!